The ground floor is undergoing renovation in 2019. Founded in 1851 The New York and Mississippi Valley Printing Telegraph Company immediately began gobbling up other financial services and communications firms. When it laid plans to extend telegraphic wires from the East to the West Coast, it changed its name to the Western Union Telegraph Company in 1856. It completed the first transcontinental telegraph line--the wires fabricated in iron--on October 24, 1861. Two days later the Government ceased operation of the Pony Express service. Individual users no doubt thought hard before using the cutting edge technology, though. Sending a telegram coast-to-coast could coast as much as $20--about $575 today. The Western Union Telegraph Company continued its aggressive policy of acquiring competitive firms and by 1884 it had absorbed 500 telegraph companies nationwide. Western Union was also zealously building in New York City. In addition to its massive headquarters building at No. 145 Broadway, designed by George B. Post, there were more than 130 branch buildings throughout the city. Two of them were completed in 1884--one on Broad Street and the other at the southwest corner of Fifth Avenue and West 23rd Street. The uptown building, with the addresses of No. 186 Fifth Avenue and No. 10 West 23rd Street, was designed by Henry J. Hardenbergh, who had just recently designed the Dakota Apartments on Central Park West. 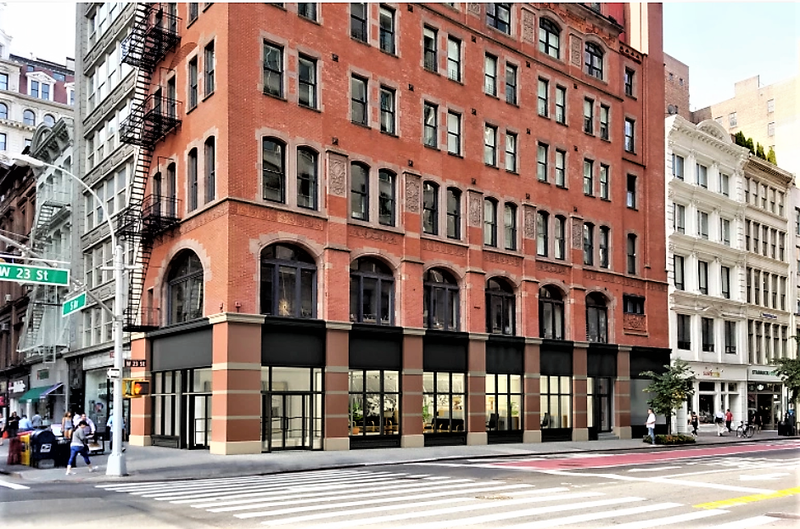 Hardenbergh turned to the currently popular Queen Anne style for the Western Union Telegraph Company building. Seven stories high, including the peaked roof punctured by story-high dormers, it was faced in red brick and trimmed in brownstone and terra cotta. Hardenberg's treatment of the two-story base was highly unusual. 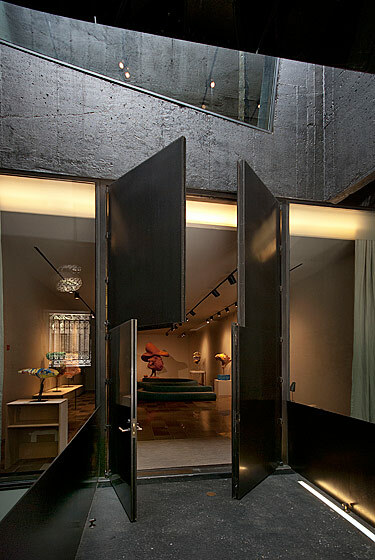 Its highly-unusual Fifth Avenue elevation included a protruding show window nestled within slightly recessed storefront, and a metal-framed oriel within a gaping arch on the second floor. Two-story arches along 23rd Street were separated by brick-and-stone piers. Hardenberg embellished what was other a somewhat reserved structure with elaborate terra cotta and stone decorations. Elaborate panels decorated the third and sixth floor piers, terra cotta Queen Anne-style motifs adorned the frieze below the cornice and filled the pediments of the dormers. Most striking was the panel above the 23rd Street entrance. Here an intricate panel announced The Western Union Co. and two profiles representing the East and West Coasts were connected by a telegraph cable. Electricity sparks from the twisted telegraph cable connecting the East to the West, depicted by a Native American. A creative innovation was included in the 23rd Street building. 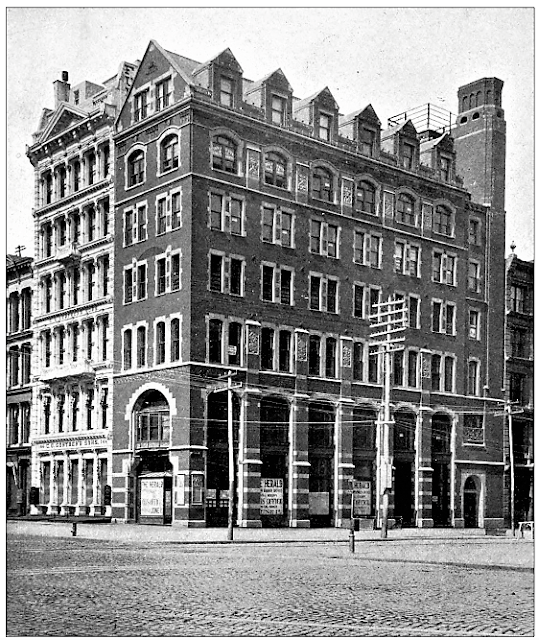 On February 20, 1883 The Sun reported that it would be connected to the Broadway headquarters by pneumatic tubes. "Within six months the pneumatic tubes are to be laid between the new up-town headquarters and the main offices at Dey street." Their purpose was to "carry a large batch of dispatched. One tube will be used for distributing and one for collecting messages." Messages could cover the two-mile distance within two minutes. 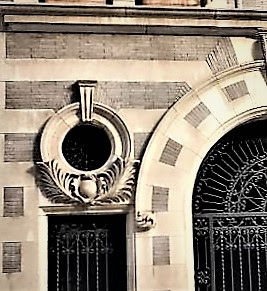 Hardenberg included delicate, subtle Aesthetic Movement decorations like the sprouting plants carved into the second floor arch. The ground floor space became home to the branch offices of the New York Herald newspaper. The second floor housed the National Wood Mfg. Co., makers of parquet flooring and other architectural woodwork. Offices in the upper floors filled with a stunning number of architectural firms. The several architects were, most likely, attracted by the fact that the Architectural League installed its headquarters in the building. It was here that the League's highly-anticipated annual exhibitions were staged. On December 15, 1887, for instance, the New-York Tribune reported "At the Architectural League's rooms, No. 10 West Twenty-third-st., there was an exhibition yesterday of the forty-four entries for gold and silver medals to be exhibited at the League's annual exhibition, to be opened on December 19." Not only did Henry J. Hardenbergh move his offices into the building which he had designed, but so did Berg & Clark, Walter C. Hunting, Charles L. Eidlitz, A. C. Jacobsen, William E. Young and Charles B. Gillespie. 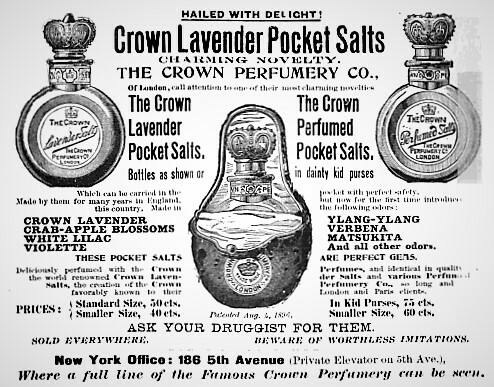 Th Crown Perfumery Co. was a much different type of tenant. The stench of horse dung and other unpleasant odors on city streets, especially in hot months, prompted refined ladies to carry pierced silver vinaigrettes that held perfume-soaked pumice stones or smelling salts. The Crown Perfumery Co. melded the two with its perfumed pocket salts. Elegant glass containers were sold within kid leather "purses." The company's 1897 advertisements noted that their wholesale offices could be accessed by a "private elevator at 5th Ave."
In 1901 Seth Low was elected Mayor of New York on the newly-formed Fusion ticket, defeating the Tammany Hall candidate. He immediately launched a hiring campaign to replace the civil servants of the former corrupt administration. On November 9 The Evening World reported "Already the Army of Fusion is busy seeking jobs for the men who worked hard for the success of the ticket. Mayor-elect Seth Low has rented an entire floor at No. 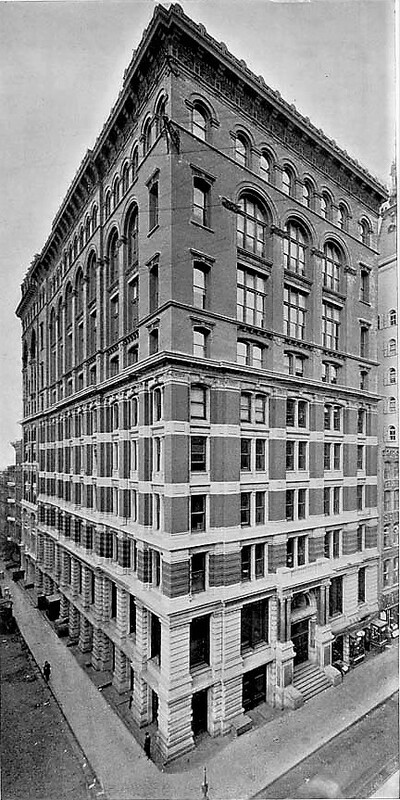 10 West Twenty-third street...where his secretary, John C. Clarke, will open 'application headquarters' on Monday morning." In the first years of the 20th century the publishing firm Revell Company called the building home, as did offices of The Roovers Manufacturing Co., machinery makers. 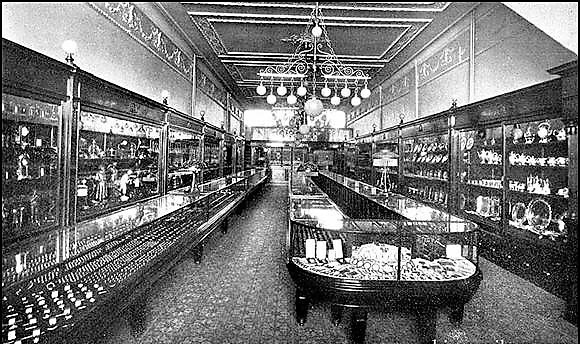 In May 1905 the architectural firm of John B. Snook's Sons remodeled the ground floor storefronts. The renovations would last only seven years. When the upscale Chicago-based silver manufacturer Lebolt & Company took the first and second floors in 1912 the show windows were updated by architect J. P. Whiskeman. His plans, filed on August 16, estimated the cost at $2,000, or just over $52,000 today. 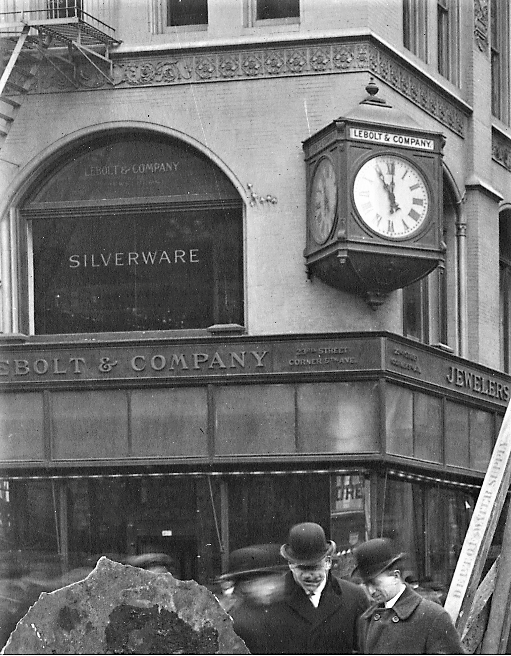 The upscale silver firm moved in just as the shopping district of the Ladies' Mile was migrating northward. On June 10, 1916 the Real Estate Record & Builders' Guide commented on the plummeting property values in the Fifth Avenue and 23rd Street district. 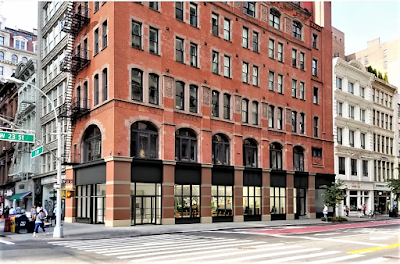 "The building at 186 Fifth avenue, southwest corner of 23d street assessed at $620,000 in 1908, stands now at the assessed value of $220,000." The store nevertheless remained at least through 1918. In 1919 the building became national headquarters for the Delta Upsilon fraternity. It published its Delta Upsilon Quarterly here for several years. The Boy Rangers of America, a precursor of the Boy Scouts of America's cub scouts program, was organized in 1913. By 1923 its national headquarters was at No. 10 West 23rd Street. Open to boys from 8 to 12 years old, it described itself in an advertisement that year as "An Indian Lore Organization" and said it offered a "most fascinating and developing program." The organization would remain here at least through 1938. As the neighborhood continued to change, so did the tenant list of No. 186 Fifth Avenue. In 1927 the headquarters of the Lord's Day Alliance of the United States was here, a group determined to "make the modern Sunday conform with the old-time Sabbath," according to The Evening Post. And when a boy scout named Peter Briglin wrote to Boys' Life magazine in December 1936 asking "Where can I get white quills, or duck feathers suitable for making a headdress?" the editor directed him to "Plume Sales & Trade Co., 10 West 23rd Street." Other tenants throughout the 20th century included the Allied Brief Case Company in the 1950's and '60's; and Shake Records, The Viking Press, and the Pecos Valley Spice Company in the 1980's. In 1993 the ground floor space that had once exhibited costly sterling silver bowls, trays and tea sets became home to Isaac Mor's Multi-Security Locksmith shop. But eleven years later the Ladies' Mile neighborhood was being rediscovered by massive retailers like Bed, Bath and Beyond, Staples, and--most threatening to Mor--Home Depot. He was understandably nervous, telling The New York Times journalist Glenn Collins in September 2004 "This will affect the whole neighborhood. A lot of stores around here will go out of business." Mor was right. Mom-and-pop operations were nudged out by rising rents as trendy cafes and shops moved in alongside the behemoth retailers in what was now called the Flatiron District. On February 25, 2007 The Times reported "five floor-through condos are planned" for No. 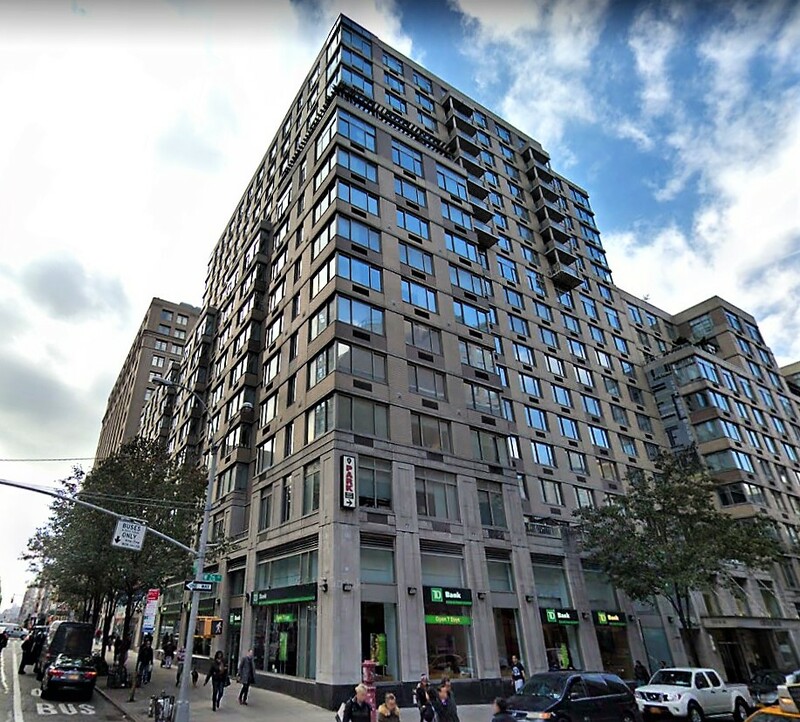 186 Fifth Avenue, and Leah Goldfarb, its sales director, said that two had already been sold. In 2018 Bank of America leased the ground floor and part of the second as a full-service branch. Plans were approved to redesign the ground floor storefronts at the time. Henry Hardenberg's striking Queen Anne style building is greatly overshadowed by the magnificent attention-grabbing Flatiron Building directly across the street. It nevertheless deserves a pause to take in those glorious panels and overall design. Auctioneer Phillip A. Smyth refused to sell the rowhouse at No. 170 East 77th Street at his foreclosure auction on January 18, 1896. He considered the highest bid, $7,450, too low. Before long a better offer was presented by developers Hall & Hall, who purchased the house next door as well. Thomas and William W. Hall were well known in real estate circles for erecting high-end speculative homes, many of them near Central Park. They had something much different in mind for these properties. The wealthy families who moved into mansions like those the Hall brothers were erecting needed nearby carriage houses. And so Hall & Hall commissioned architect Alexander Welch, of Welch, Smith & Provot to design two handsome private stables on the lots. Completed in 1898, the two two-story buildings were architecturally harmonious; yet each flexed its own personality. The overall-plan was identical. The ground floor included a large arched carriage bay flanked by a window and entrance on the ground floor. The second stories were treated identically--two sets of paired openings separated by a blind recessed panel. Welch clad No. 75 in red brick, No. 77 in gray iron spot brick. Millionaires' carriage houses were often lavish affairs, reflecting their wealth and social status. Welch, therefore, embellished No. 77 with oeil de boeuf, or ox-eye, windows within molded frames decorated with palm fronds and cartouches. Brick panels were deftly inlaid into the limestone within the carriage bay arch. The ground floor interiors were finished in oak. There were six horse stalls toward the back and a "wash deck." The second floor, accessed by a staircase and elevator, held the hayloft and two coachmen's quarters (which faced the front, helping to avoid the odors of the manure pit to the rear). On December 6, 1899 The Sun reported that "W. W. and T. M. Hall [have sold] the new private stables" at No. 77 East 77th Street. The buyer was George Theodore Bliss, who lived in an imposing mansion at No. 860 Fifth Avenue, between 67th and 68th Street. The 48-year old was the son of George Bliss, an original partner in the banking house of Morgan, Bliss & Co. George T. Bliss remained a member of the firm when it was reorganized as the Morgan Trust Company. He had inherited a substantial fortune from his father, augmented by his own major stock holdings in mining and banking firms. Bliss and his wife, the former Jeanette Atwater Dwight, had one daughter, Susan Dwight Bliss. Moving into the 77th Street carriage house with the Bliss horses and vehicles were the family's 30-year-old British-born coachman, John Radford, his wife and her three children by a former marriage. The other quarters were occupied by Edward Foley, a groom. The 26-year-old was born in Ireland. In 1901, less than two years after purchasing the carriage house, Bliss experienced a perfect storm of medical problems. Already weakened by an attack of influenza, he was struck with appendicitis. He underwent an operation, but was unable to recover from the procedure. He died on March 24, 1901. Coachman--By young married Englishman; thoroughly understands care of fine horses and carriages; willing to be generally useful; country preferred; good references. Coachman: married, aged 34; thoroughly competent in every respect, first class city references; city or country. Address Coachman, 77 East 77th st.
That coachman's replacement, named Webster, did not last long. He too was looking for a new position in March 1909. Phillips Phoenix sold his similar two-story stable directly across the street at No. 78 in April 1913. Developer A. L. Mordecai & Son had been accumulating surrounding property and on March 1 the Real Estate Record & Guide explained "The stable threatened to be an obstacle to the re-improvement of the rest of the plot." Phoenix moved his vehicles across the street to No. 77. His home was at No. 3 East 66th Street and he maintained a summer home in Tuxedo, New York. Wealthy and a touch flamboyant, the attorney and his wife, the former Lillian G. Lewis, were well-known in society. His business interests sometimes ran far afield of those of his neighbors. He had, for instance, built the Madison Square Theatre at a time with polite society may have attended the theater, but avoided involvement in its operations. The son of J. Phillips and Mary Whitney Phoenix, he had graduated from Harvard Law School in 1854. An avid sportsman in his younger years, he now focused more on automobiles and was a member of the Automobile Club of America. His more traditional memberships included those in the Union, Knickerbocker, Metropolitan, Union League, Turf and Field, and New York Yacht Clubs, as well as the St. Nicholas Society. In addition to Tuxedo, Phillips and Lillie (as she was familiarly known) routinely spent time in the warm months at the Aspinwall Hotel in Lenox, Massachusetts. Lillie, like many socialites, did not allow her husband's business to interfere with her own leisure. She regularly appeared in society columns as she arrived alone at the Aspinwall and other fashionable resorts like the Briarcliff Lodge. The 87-year-old millionaire died in his 66th Street mansion on April 11, 1921. Oddly enough, Lillie did not follow the expected mourning protocol, which would have restricted her appearances within society for a year. Three months later, on July 17, 1921 the New-York Tribune reported that "Mrs. Phillips Phoenix...was a late arrival at the Aspinwall." Phoenix left an estate of nearly $2.6 million. The accounting listed the value of No. 77 East 77th Street at $65,000--about $890,000 today. Two years later the building was converted to a garage on the first floor and a "dwelling" on the second. It was home to Emma A. Hamilton, widow of William H. Hamilton, by 1926. In 1969 the building was converted to a private residence, home to Jules Goldstein and his wife, the former Jeanette Rosenberg. A lawyer, Goldstein was a graduate of City College and New York University Law School. His career, however, was wide-flung. He was also executive secretary of the Trouser Institute of America, a member of the Management Labor Textile Advisory Committee of the Federal Trade Commission, and executive secretary of the National Outerwear and Sportswear Association. Jules Goldstein died at University Hospital in December 1971 at the age of 80. The house became home to Delbert W. Coleman, former CEO of jukebox firm J. P. Seeburg Corporation, and his wife. The house was the center of an embarrassing snafu in 1976. On January 26, the Colemans sent out about 100 formal invitations for a fund-raiser for Senator Frank Church to be held on February 10. But after poking around into Coleman's background, Church's campaign staff "suddenly discovered that it had scheduled another fund-raising affair the same evening," reported Dan Dorfman in New York Magazine. It seems that after Coleman sold his interests in Seeburg, he used the money to buy control of Parvin-Dorhmann Company, an operator of Las Vegas casinos and hotels. Within a year Coleman had made a paper profit of over $34.5 million; a meteoric rise in value which prompted an SEC investigation and a charge of stock manipulation. The Colemans were followed in No. 77 by Edward S. Finkelstein, chairman of R. H. Macy & Company. Living here by 1988, he was widely credited with resuscitating the once-dowdy department store, restoring the ground floor to its original splendor--including the handsome polished wood cars of the Edwardian elevators. It was Finkelstein who re-instituted the Macy's Fourth of July fireworks as a part of the national celebrations. When the house was sold for $2.58 million in December 1993, it was described as having three bedrooms, five baths, a "library overlooking dining area," and "double-height living room." There were also two fireplaces and a roof deck. In 2005 plans were filed for a "vertical enlargement of one family dwelling." That barely described the project. Radio entrepreneur Adam Lindemann would not only expand his home upward, but down. His architect, London-based David Adjaye, would do a gut renovation that added three floors atop the original two, and two more below ground. The renovations took years to be completed. On May 22, 2011 New York magazine's Justin Davidson wrote "With the flamboyant orneriness that limitless wealth allows, the art collector Adam Lindemann and his wife, Amalia Dayan, have staged an act of architectural dissidence on the Upper East Side. Lurking behind the limestone scrolls and wrought-iron gate of the carriage house at 77 East 77th Street is an eccentric concrete chateau." Strikingly, the massive re-do is not noticeable from the street. Davidson described it saying that Adjaye had confounded "the Upper East Side's aversion to novelty by combativeness and stealth." The Upper West Side embraced the concept of multi-family living early on. At the turn of the last century scores of brick and brownstone residences, erected only 15 or 20 years earlier, were razed for apartment buildings. 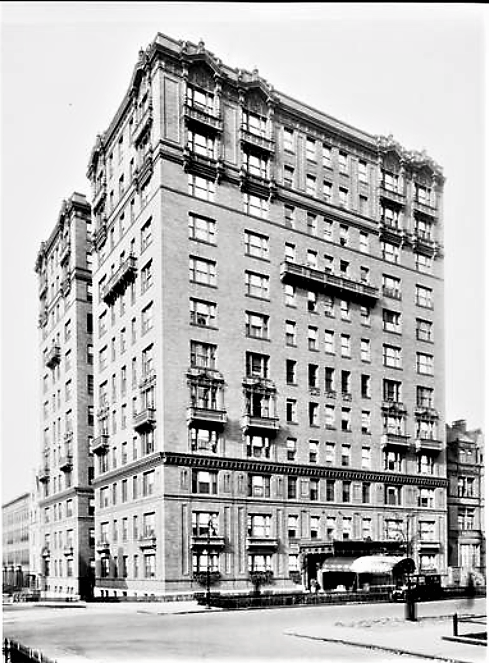 In 1915 the Charmon Construction Company demolished eight rowhouses at the northwest corner of West End Avenue and 75th Street to make way for one more. Designed by the firm of Neville & Bagge, the 12-story structure, completed in 1916, was essentially Renaissance Revival in design. The architects splashed an otherwise austere facade with sumptuous terra cotta ornament tinted to match the orange-brown Roman brick. It structure cost $600,000 to construct, in the neighborhood of $13.8 million today. The elaborate entrance under a glass and iron marquee featured a terra cotta frame of vases, shields and swags upheld by engaged Doric columns. Pseudo balconies clung to second floor openings, and ornate panels decorated the third floor beneath a complex terra cotta cornice. The hue of the terra cotta balconies is an almost exact match to the brick. The two-story framings and balconettes of the windows at the fourth and fifth as well as the topmost floors were worthy of a doge's palace. Striking, hefty balconies adorned the ninth floor. No. 325 West End Avenue was designed as two connected wings with a light court between. Each section contained two apartments per floor. The western wing held one 11-room suite and one 5-five apartment per floor. 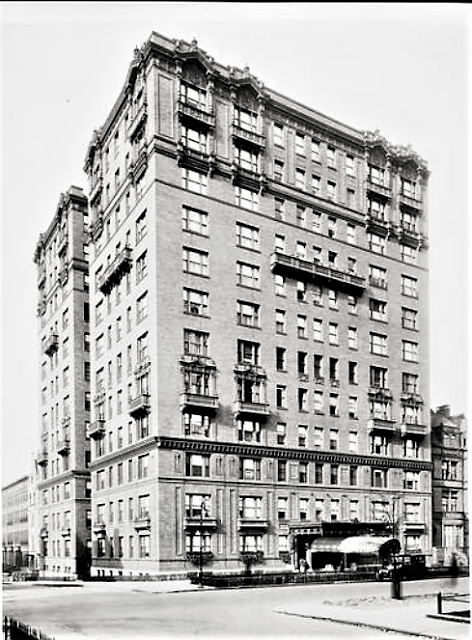 The wing fronting West End Avenue had 9 and 7 room apartments on each floor. Steven Kates, in his 2017 book Family Matters! A Memoir, recalls some of the details incorporated for the upscale families who would occupy the sprawling spaces. "Our apartment had two master bedrooms and two servants rooms off the kitchen, in which there was a call board which indicated which 'chamber' was buzzing for assistance (call buttons in the two bedrooms and the living room, with a floor button under the dining room table)." Structures on the roof, invisible from the street, held the laundry, a servants' bathroom for those chambermaids doing the wash, and three auxiliary servants rooms. Among the first tenants were Joseph B. Greenhut and his wife, the former Clara Wolfner. A Gettysburg hero, he retained the title of captain. In 1902 he purchased the massive Siegel-Cooper department store on Sixth Avenue, and in 1906 he bought Benjamin Altman's emporium directly across the avenue for his Greenhut & Co. drygoods store. Greenhut's investments were ill timed, however. Retailers were abandoning the Ladies' Mile and moving further north. In 1914 the Siegel-Cooper store failed and the following year Greenhut & Co. closed. Joseph Greenhut admitted "As one after another big concerns quit and moved away we were left high and dry to fight the fight alone." Despite the significant losses, the Greenhuts continued their upscale lifestyles. One of their first entertainments in No. 325 was their golden wedding anniversary. On October 15, 1916 The Evening Telegram reported on their "informal reception at their house." The New York Times agreed that it was informal, since no invitations were issued, yet estimated that "About four hundred called to offer congratulations." Following the reception the Greenhuts' son, Richard, hosted a dinner where the "entire entertainment suite on the second floor of Sherry's was used." In reporting on the event, The Times reminded readers that the Greenhuts' summer home, Shadow Lawn, in Long Branch, New Jersey was "now occupied by President and Mrs. [Woodrow] Wilson." Superintendents of high-end apartment buildings held sway over which suppliers of ice and milk, for instance, were admitted. It was fertile ground for bribes. And Lucius M. Kimball was not adverse to augmenting his wages by graft. He found himself defending himself in court, however, on December 5, 1916. The State had noticed that the price of household milk was inexplicably high compared with the cost of producing it. An investigative body, the Wilks Committee, discovered that consumers were paying for the kickbacks enjoyed by superintendents. Kimball came clean on the stand, admitting he received $1.50 from Sheffield Farms for every customer in the building. When asked about the ice dealer, he identified Corcoran & Ward. "I think they pay $2 a customer...They've made two payments--around $50 for the two." The payback would be equal to a little over $1,000 today. He went on to name the daily newspaper vendor, and the baker (although the latter paid him him in "a loaf of bread and five rolls each morning"). Kimball told the judge "It's embarrassing to say so, but it's the situation." But the temptation was understandable. The bribes he received from the vendors easily matched or surpassed his $150 per month salary. In June 1918 Joseph Greenhut suffered symptoms of heart trouble; and then on October 14 he suffered a heart attack. Ten days later The New York Herald reported he was "seriously ill of heart disease at his home No. 325 West End Avenue." The family, said the article, was "holding out hope" for the recovery of the 75-year old. Greenhut lingered, bedridden. His eldest son read him the happy news of armistice on November 12 after which the old man commented that he could now die content. He did so five days later. Social columns routinely followed the movements of the well-to-do residents and announced the debutante entertainments, engagements and weddings of their daughters and sons. Among such prominent families were those of residents Arthur Harris, Michael William Dippel, and Henry F. Tiedemann. Before 1920 the family of well-known attorney Charles Arndt was in the building. His name often appeared in newspapers connected with the settlement of large estates. Every family in the building maintained a small domestic staff, as repeatedly reflected in help wanted ads. One, for instance, in February 1921 sought "Maid--Wanted personal maid for one lady, one who is also willing to assist with light chamberwork...Protestant preferred." Later that year the tenant in apartment 1-D needed a "Girl, French, for girl 12 years old and sewing." The advertisements always demanded references and interviews, of course, were intensive. But the precautions did not always prevent servant troubles--as Mrs. Estelle Lowenthal discovered in 1926. The Lowenthal's chambermaid, Freda, was doing more snooping than cleaning in their bedroom when she discovered love letters to Estelle from another man. Freda pocketed the incriminating evidence and quit her job. When she telephoned her former employer and threatened to expose her, Estelle hung up the phone. And then she went to the police. Certain that her former mistress would pay for the letter, Freda convinced Marcell Dreifuss, who was in love with the out-of-work maid, to go to the apartment and extort payment. When he arrived he demanded $25,000 for the letter. Instead, detectives who had been staking out the apartment arrested him. In court on August 9, 1926, his attorney John Caldwell Myers explained to the judge that he was blinded by love. "His weakness lay in what the poet has chosen to refer to as 'The light that lies in woman's eyes.'" The defense did not work. The light court which sliced between the east and west wings provided additional ventilation and sunlight to the apartments. The Arndt family was still living here when son Christian was married to Louise Clausen in a notable society wedding in St. Barthlomew's Church on October 10, 1933. The reception was hosted by George F. Baker, Jr. and his wife, in their grand mansion at No. 75 East 93rd Street. At mid-century the occupants of No 325 West End Avenue continued to be still upscale and it appears that one or two servants' rooms in the apartments fell short for some. In 1948 a penthouse level was added containing a single apartment plus eight maid's rooms rentable to residents. The affluence of the residents was evidenced in May 1956. As with all upscale apartment buildings, No 325 essentially emptied out for three months in the summer when residents left for their country homes. When Mrs. Frances Bleiberg arrived at her "summer bungalow" at Lake Peekskill near the town of Putnam Valley she found it ransacked. Although some articles like an expensive camera and a radio were taken, the thieves were most interested in clothing. More interesting than the description of Frances's things were the items stolen from her husband. Included were six pairs of cashmere socks, two pairs of alligator shoes, and a cashmere jacket. The jacket was valued at more than $1,000 in today's money. There were, of course, people involved in the entertainment industry here as well. On the 6th floor in the 1960's was Gene Callahan, a Hollywood production designer and director who won three Academy Awards for America, America, The Cardinal, and The Hustler. Jazz drummer, instructor and author Melvin Sokoloff, known professionally as Mel Lewis lived on the second floor with his wife, Doris, and their three daughters beginning in 1976. Nominated for 14 Grammy Awards during his career, he was a fixture at clubs like the Village Vanguard in the 1970's and '80's with his Mel Lewis and the Jazz Orchestra. Lewis's biographer Chris Smith, in his 2014 The View from the Back of the Band, noted Apartment 2C "also became the hub for his teaching and mentoring of musicians. Many of today's greatest jazz musicians spent countless hours in that apartment listening to and talking about music with Mel." The musician was diagnosed with melanoma in the late 1980's. He died still living here on February 2, 1990. The building got its brush with cinematic fame in 2004 when it served as the home of characters Joanna and Walter Eberhart (played by Katherine Ross and Peter Masterson) in The Stepford Wives. The couple moved out of the building to settle in the idyllic village of Stepford, Connecticut, with unhappy results. No. 325 was converted to co-ops in 1972. The address got another celebrated resident in 2016 when actress and comedian Ellie Kemper and her husband, writer and producer Michael Koman, bought an apartment. The restaurant as it appeared in 1920. Christmas wreaths adorn the windows and a roof of clay tiles has been added to the storefronts. photo by William J. Roege from the collection of the New-York Historical Society. In the 1860's the block of Seventh Avenue between 25th and 26th Street was lined with second hand stores. At No. 275 was H. Hart who advertised on May 3, 1864, "if you want to see after your advantage by selling your Cast Off Clothing, Furniture and Carpets, then give me a trial." Nearly identical ads were placed by shop owners up and down the block, including Morris Abrahams who ran the store at No. 274 by 1870. One advertisement promised "M. Abrahams will pay the best prices for ladies' and gents' Cast-off Clothing, by calling or addressing by post." Another, in 1870, assured nervous women, "ladies attended to by Mrs. Abrahams." Abrahams, his wife Minnie, and their two sons Mark and Samuel (their surname was confusingly listed as Abrams, Abraham, and Abrahams) lived above the store. No. 274 was the center in a row of three identical four-story brick-faced buildings. Each had a store in the ground floor and residential space above. A simple bracketed cornice united the structures. It is unclear when Abrahams purchased No. 274; but he owned it in 1892 when Joseph Guffanti leased the store for his saloon. What made his tavern slightly different, and what would change his future forever, was the little room in the back where patrons could purchase lunch or dinner. On July 1, 1900 The New York Times described Guffanti's saloon, saying, "The room in which liquid refreshments are served opens on the street and is like most other saloons of the neighborhood, except that it is a little more dingy and dark. But the restaurant, entered by the saloon's back door, is unique, for nobody else knows how to concoct the strange dishes that are prepared there, and Joe never loans out his receipts for cookery." It was not Joe's wife, Mary, who did the cooking, but Joe himself. He opened the kitchen during specified lunch and dinner hours. In the eight years he had operated by the time of the Times article, word had gotten out. "The stroke of the clock seems to fill the six or eight small tables like magic." But in 1900 Guffanti's was by any description still more saloon than restaurant, and its patrons mostly working class. "In the centre of the dining room are a couple of pool tables, designed not for the acquirement of revenue but for the amusement of guests who happen to come in a few minutes ahead of eating time." But the article did hint of things to come. Guffanti's authentic Italian cuisine was drawing more affluent patrons who bypassed the bar and headed straight for the back room. "Italians naturally predominate, but they are of the more prosperous class and are almost all well dressed. Then there are business men of the neighborhood, who like Joe's food better than what they can get at home; men-about-town, whose appetites have grown satiated with the elaborate viands of restaurants more 'swell': reporters, detectives, actors, and a variety of other wanderers for whom the odor of Signor Guffanti's soup has a pleasant charm." Joe Guffanti had yet to realize the potential of his cooking. The article noted that the walls of the restaurant room were unpainted and the furniture was "well nigh ready to fall to pieces." But that would change before long. Born in Lake Como, Italy, Guffanti had come to America alone while still a boy. He and his wife Mary (who was Irish) had five children, Joe, Jr., Irene, Alexander, Madeline, and Frances. A few months before The Times article, Joseph had decided to go back to his homeland. It had been, after all, decades since he had seen his mother and brothers. He booked a steerage ticket and turned the saloon over to a trusted employee. He anticipated the trip would last two or three months. It did not. Three weeks later he was back in the saloon. He explained "I thought I'd have a mighty fine time, but when I got home the guys around there knew I was an American by the cut of my trousers. So they pulled my leg and tried to work bunko games on me and played hell with me generally. I couldn't stay in the country--couldn't stand it--that was all there was to it." As for his family, "I was glad to see the old woman, but my brothers wouldn't have anything to do with me. When I got there it was early in the morning. Before noon I was packing up my valise, and that night I pulled out. No. Sir! I'll never go back again. An American can't stand it over there." In 1902 Morris Abrahams purchased No. 272 (it had housed a barber shop for years). 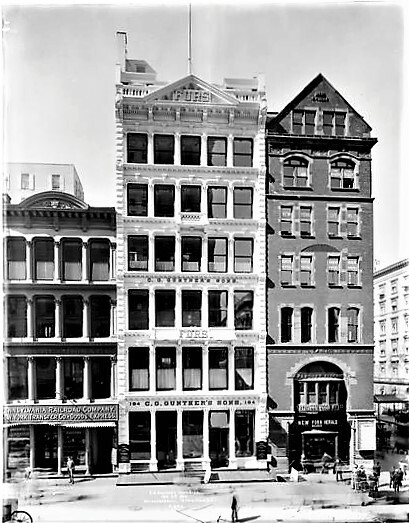 He now owned all three of the 20-foot wide buildings and soon connected the upper floors internally as a hotel--albeit not an especially high class operation. His son, Mark, hired architect Joseph Kelly to make "improvements on the 4-story hotel," now using the single address of 274 Seventh Avenue, in May 1907. The following year, in June, Joseph Guffanti expanded. By now he had realized that his fortune was not in running a saloon, but a restaurant. When he renewed his lease on No. 274, he leased No. 272 as well. The Real Estate Record & Builders' Guide noted "permission given under terms of lease to connect." Within three years Guffanti's Restaurant would engulf all three storefronts. Author Helen Bartlett Bridgman described the restaurant in 1920 as it was around that time of the expansion. "Guffanti's was then a modest restaurant in an unfashionable quarter of Manhattan...For half a dollar in the early days of this century, one had quite enough, but not too much for twice as much. Every dish then as now was delicious; but judgment in quantity as well as quality was in evidence. "The pace was set by the crisp freshness of the onions and radishes, served with sardines and anchovies, as a snappy prelude to a heaping platter of the best spaghetti that ever was, enriched by a red sauce that cannot be surpassed in Italy itself." She went on to describe the sauce as being prepared with "tomato paste, chicken livers, peppers green and red, onion, oil, lemon and spices" and called the minestrone "almost a full meal." 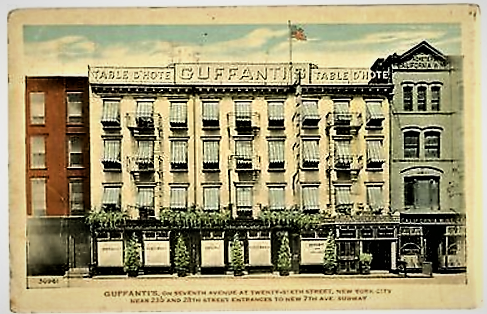 In 1910 the New York Hotel Record described Guffanti's as "Famous for table d'hote dinners, serving from 900 to 1,500 dinners daily in typical Italian style, with music." Joseph Guffanti had made it. An early postcard included modes of modern transportation--a blimp, a biplane and a motor car. The music the Hotel Record had mentioned were singing mandolin players. In her 1920 book Within My Horizon Helen Bartlett Bridgman remembered a visit years earlier. "By and by one of the mandolin players...rose and sang in a remarkably good baritone, walking back and forth as he did so, while his companion joined with zest in the chorus, giving 'O Santa Lucia' with a yearn in the prolonged 'O' and a tender pride in the 'Lucia' which I have never known before or since." She commented "Guffanti must be a millionaire by now," recalling that years earlier, "Every seat was filled, with many waiting; for the public knows a good thing when it sees it." When Joseph Guffanti had first opened his saloon and restaurant Manhattan's theater and entertainment district was located just three blocks south, on 23rd Street. The New York Times decades later remembered the entertainers who haunted the restaurant. "Enrico Caruso sang there many times to patrons including John Barrymore Alfred E. Smith, Diamond Jim Brady, Lillian Russell and John Philip Sousa." 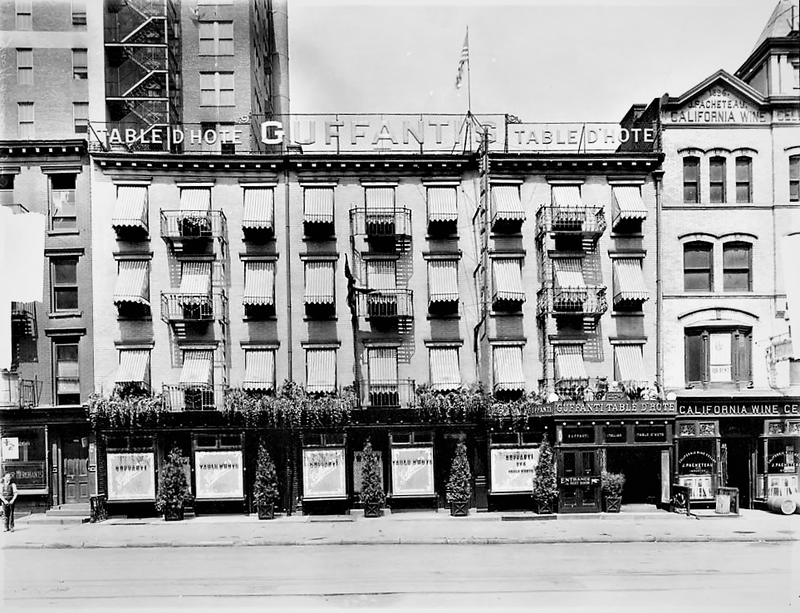 As the theaters moved north to Times Square, Guffanti responded by opening a second restaurant at 161 West 40th Street. Additionally, he established the Guffanti Inn on Ocean parkway in Coney Island. On September 8, 1919 the New-York Tribune reported on an afternoon event that day. "Meeting of Italian restaurant men to arrange a dinner and entertainment for the sailors of the Italian battleship Conte Di Cavour at Guffanti's." The focus of the several restaurant owners present that day would change drastically in two months. On November 18 Congress passed the temporary Wartime Prohibition Act that prohibited the sale of alcoholic beverages (it was originally intended to save grain for the war effort; however the war had ended a week earlier). The Act went into effect on June 30, 1919 and permanent Prohibition began on January 17, 1920. Prohibition posed a major threat to hotels and restaurants and, in fact, was directly the cause of hundreds to fail in New York City over the next few years. 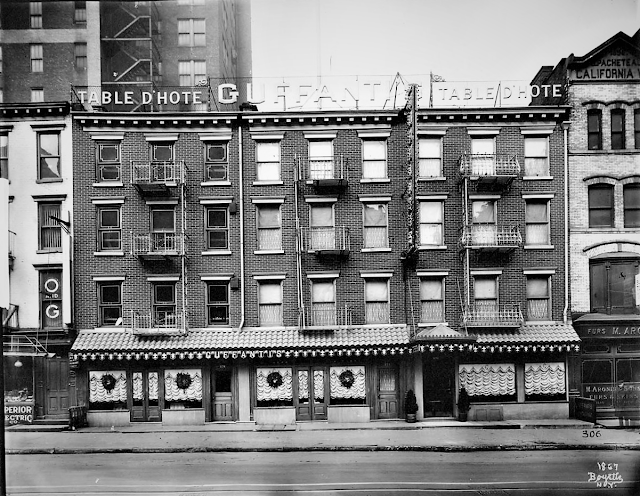 On February 22, 1920 the New-York Tribune ran an article entitled "Death of the Table d'Hote" and predicted that Prohibition would be the end of such restaurants (table d'hote referred to their offering specific dishes at fixed prices, unlike ala carte restaurants). "Unless the law is altered to permit wine, half the table d'hote restaurants will go out of business, and that will be a sad thing for New York." The article listed Guffanti's among the long list of restaurants it deemed as being endangered. "So it would seem that New Yorkers all these years when they were supposed to have been 'dining out' actually were 'drinking out.'" Joseph Guffanti responded by circumventing the law. On March 24, 1920 Federal agents barged into the Seventh Avenue restaurant and, according to the New-York Tribune, "seized 100 barrels of whisky, valued at $200,000." And two years, later, on January 9, 1922 The New York Herald ran the headline "Guffanti's Raided; 2 Held, Wine Seized." The article noted "Guffanti's had claimed the attention of prohibition agents for several months. Several of the agents, posing as customers, took seats at a table and received a quart of wine, for which they paid $5." But Guffanti had learned his lesson from the first raid. Wherever the wine came from, the agents could not find it. After head waiter Gane Ganella and the offending waiter Benjamin Meshio were hauled off, "the agents made a search of the premises, but found no intoxicants other than the quart of wine they said they bought." Joseph Guffanti had other problems that year. His son, Alexander, had become a stock broker. 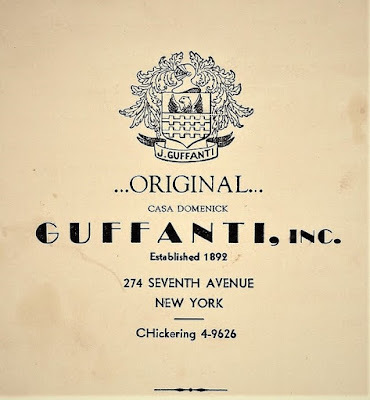 In order to induce him to join the family business, Joseph offered him 50 shares of Guffanti Inn stock to give up his Wall Street job. The young man did so, but when his father became suspicious of his "handling of the cash," he fired him. On September 1, 1922 Alexander took his father to court demanding his stock, which was reportedly worth $50,000 (more than three quarters of a million today). This hand colored vintage postcard was a marketing tool in the 1920's. 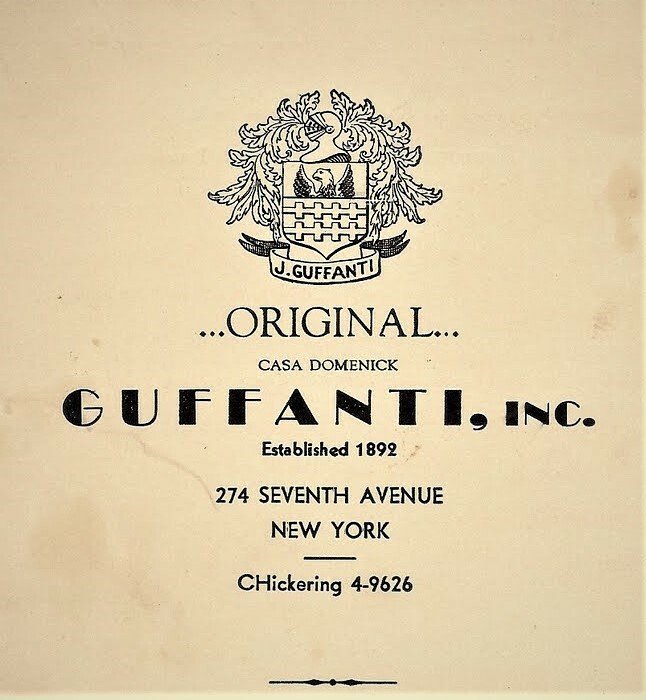 In 1925 Joseph put his nephew, Domenick Casiero, in charge of the Seventh Avenue restaurant in order to devote his full energies to the Guffanti Inn. Like his uncle, Caserio had come to New York as a boy. He was 15 when he left Trambinello and immediately went to work at Guffanti's as a busboy. He had worked his way up to waiter, captain, maitre d'hotel, and now proprietor. Joseph Guffanti died four years later, on February 23, 1929. His widow, Elizabeth, was his second wife. His estate (reported by The New York Times at $1,039,598) was divided among Elizabeth and the children. Most likely Joseph Guffanti had insisted that his nephew preserve the restaurant's well known name. And he did; although he sneaked "Casa Domenick" in small lettering on the menu and wine list. Domenick managed to slip his own name onto the menu. Caserio's two sons, Edmund and Robert, worked in the business with him. When Domenick died on April 11, 1952, at the age of 66, The Times noted that the sons would "continue to operate the restaurant with their mother." In reporting on his death, the newspaper mentioned that Guffanti's Restaurant was the "rendezvous for opera stars, politicians, actors and musicians" and said "Although the restaurant now is surrounded by the fur district, many of the older actors still dine there regularly." The restaurant received some bad press when a patron, Rose Puleo, fell down the steps leading from the upstairs women's room on April 7, 1954. She was a "pocketbook worker" employed by Garay & Co. nearby at No. 33 East 33rd Street, making $67 a week. Rose claimed that her tumble was caused by worn carpeting and a loose stair tread. Now, said her lawyer, she was no longer able to work, had incurred heavy medical costs and lost wages. She sued for $75,000 to cover her lost income and medical bills. Her husband, Joseph, claimed that because of his wife's injuries and inability to work, he was due damages totaling $25,000. Their $100,000 lawsuit would equal more than nine times that much today. Although the Domenick brothers' attorney cast serious doubt that the carpeting was worn or that the staircase was not maintained (essentially intimating that the fall was planned), the Puleo's were awarded $12,233.50. The venerable Guffanti's Restaurant closed sometime in the 1960's. The entire block of 19th century buildings was razed in 2000 to be replaced by the 17-story apartment building, Chelsea Centro. Half a century after its doors were closed few New Yorkers remember that the once-famous restaurant ever existed. Someone thought it would be a good idea to paint the limestone at the entrance level gray. It wasn't. Although only steps from Fifth Avenue and Central Park, the ten brownstone residences erected by developer James E. Coburn on the north side of East 73rd Street in 1871 were not mansions. For the time being Manhattan's wealthiest citizens were content to live below 57th Street. But they hinted at things to come. For Sale--That New and Well Built House, No. 17 East Seventy-third street; hard wood finish; 22x60; four stories and basement. Designed by J. W. Marshall, it and the rest of the row were aimed at more affluent owners--such as Ernst August Roesler, who would live here. Born in Germany in 1844, he and his wife, the former Clara Mueller, had a daughter Ottilie. Following Clara's death in 1883 Roesler married Augusta Koehler. The couple had another daughter, Therese Auguste Louise. But her half-sister would not see her grow up in the house. On the afternoon of April 17, 1888 the 18-year-old Ottilie was married in the parlor. It was a wedding that was covered by all the newspapers. The bridegroom was George A. Steinway, eldest son of piano maker William Steinway. The Evening World reported "Many telegrams of congratulations have been received not only from all parts of this country, but from friends of both families in Hamburg, London, [St.] Petersburg, Berlin, Dresden, Vienna, Paris and other cities of Europe." The article concluded "The presents received by the bride were very beautiful and very numerous, coming from Germany and England as well as the United States." Dinner and the reception were held at Delmonico's. Roesler died on February 10, 1900. By then merely well-to-do residents like the Roesler family were being nudged out by the fantastically wealthy. The following year millionaire publisher Joseph Pulitzer demolished Nos. 7 through 15 Eat 73rd Street as the site of his magnificent mansion designed by Stanford White. In June 1904, the year after the Pulitzer palazzo was completed, son Ralph bought the former Roesler house next door. The timing of the purchase, a year before his marriage to one of society's most eligible debutantes, Frederica Vanderbilt Webb, was most likely not coincidental. Frederica was the daughter of Dr. W. Seward Webb and Lila Osgood Vanderbilt. Her grandfather was William H. Vanderbilt. The wedding took place in Shelburne, Vermont, where her parents maintained their 3,000-acre country estate, Shelburne Farm. Its Queen Anne-style mansion contained 60 rooms and Frederick Law Olmsted had designed the park-like grounds. Webb, who had given up his medical practice to become involved with the railroads with his father-in-law, arranged a ten-car special train to transport guests from Manhattan. On October 14, 1905, the day before the ceremony, The New York Times reported "At Shelburne House, the decorators were kept at work to-night. They completed the decorations there yesterday, but the heat to-day withered them so it was necessary to do them all over again." The newspaper later reported that the wedding "was attended by 600 guests." A month later, on November 12, 1905 the New-York Tribune reported that the architectural firm of Foster, Gade & Graham had filed plans for remodeling No. 17 East 73rd Street. "The facade is to be removed and a new front of decorated limestone erected. New staircases are to be installed and the interior rearranged." The firm estimated the cost at $20,000, or about $575,000 today. The Real Estate Record & Builders' Guide reported on what might have been an embarrassing afterthought. A separate set of plans were filed, this one specifically to "install toilets." Foster, Gade & Graham worked around the old English basement plan by placing the new entrance a few steps below sidewalk level. Clad in limestone, the neo-Renaissance residence was splashed with Beaux Arts embellishments. The three story rounded bay was marked by three arched French windows, and a trio of rectangular openings separated by Corinthian pilasters, their sills dripping swags of carved roses. Similar garlands draped over blank rosettes below the elaborately carved stone cornice which supported the mansard level. The house was barely completed when Ralph and Frederica began construction of their summer home in July 1906. The Colonial-style mansion would sit on their 200-acre estate near those of William K. Vanderbilt and Payne Whitney. Back in Manhattan the newlyweds most likely never lived in the 73rd Street house. Despite the efforts and cost his son had expended to renovate the house next door, Joseph Pulitzer's wedding present to Frederica was a house on Fifth Avenue. In 1910 Ralph Pulitzer leased No. 17 to Josephine Livermore. The widow of attorney John R. Livermore, who died on May 3, 1906, she was the former Josephine Whitney Brooks. The couple had married in December 1898, The New York Times noting "The wedding was a social event. H. O. Havemeyer was the bridegroom's best man." Livermore's death was, somewhat bizarrely, brought on by the trauma of the destruction of their country home in Westchester County about a month earlier. The target of arsonists, the magnificence of the mansion and its furnishings was reflected in the silver alone--valued at around $990,000 in today's money. "The fire was a great shock to Mr. Livermore," said a newspaper following his death, "who has been ailing ever since"
As the Pulitzers continued to lease the house (to Sidney C. Berg in 1913 and Mrs. Gardiner Sherman in 1915, for instance) their names continued to appear in newspapers. In 1913 Ralph surprised most of the city when he sued the powerful Tammany-backed Mayor William Jay Gaynor for defaming his father. A few months later, in January 1914, the building in which Pulitzer's $40,000 yacht, the Bullet, was store in dry dock burned, destroying it. In August 1916 architect Louise J. Farmer did significant upgrades to the 73rd Street house for Pulitzer. His plans called for "new stairs, partitions, plumbing, brick walls." The renovations cost the publisher the equivalent $105,000 today. Ralph and Frederica had two children, Ralph, Jr. and Seward. In the autumn of 1921 a tutor was hired for Seward. Cyril Jones had served as secretary to Colonel Edward M. House during the Paris Peace Conference and was in charge of communications between him and President Woodrow Wilson. Following his discharge from the Navy, he took the job of tutoring Seward. Before long, unknown to Ralph Pulitzer, a romance was developing between his wife and the tutor. In the spring of 1922 Jones resigned to join the faculty of the Milton School near Boston. Frederica promptly sailed to Paris to begin divorce proceedings. On February 15, 1924 The New York Times reported on the pending divorce, the grounds of which were "constructive desertion." Four months later the newspaper reported that Frederica Pulitzer would marry Cyril Jones at Shelburne House in August or September. Interestingly enough, Pulitzer retained possession of No. 17. In 1927 he leased it William D. Flanders who married author Margaret Leech the following year. Upon returning from their honeymoon in England and France, they took up residence at No. 450 East 52nd Street. A daughter was born in there March 1929. Finally, after decades of leasing the home, Ralph sold it to Benjamin Joseph Buttenweiser in 1934. Five years earlier the banker and philanthropist had married Helen Lehman, daughter of Arthur Lehman, senior partner in Lehman Brothers. Son Lawrence Benjamin was born on January 11, 1932. His parents were a fascinating pair. Buttenweiser, the son of wealthy real estate operator Joseph L. Buttenwieser, was admitted to Columbia College at the age of 15, focusing on 19th century English poetry. He graduated two years later. Because Columbia University refused to accept him for its doctorate program (he was too young) he entered the banking firm of Kuhn, Loeb. And Helen was no insipid socialite. A civic leader, she was one of the first women admitted to the City Bar Association. Before moving in, the Buttenweisers got rid of the Edwardian interiors of Foster, Gade & Graham. 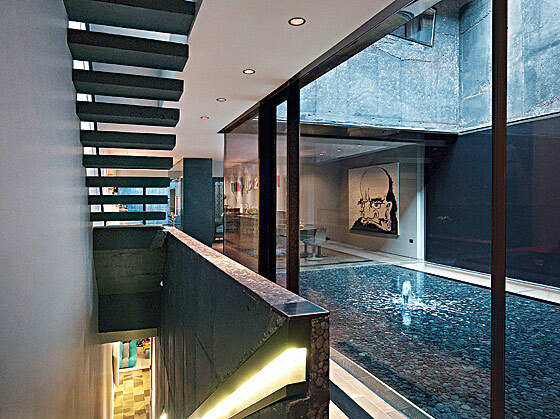 They hired the Modernist architect William Lescaze to completely redesign the interiors. On December 12, 1936 The New Yorker wrote that Lescaze "in the last five or six years has taken the lead in Modernist architecture in this country" and said that the Benjamin Buttenwieser house was one of "the only three completely Modernist town houses in N.Y.C." The result was a striking dichotomy of styles. The inside was sleekly cutting edge, while the facade remained nearly unchanged. Writing in Arts & Decoration in 1937, architecture critic Mary Fanton Roberts noted "The exterior Mr. Lescaze left pretty much as it used to be. He took a few ornaments off, substituted casement windows. All of which was probably a sound idea...although the result in no way reflects the Modern expected from Mr. Lescaze." The Buttenwiesers would have two more sons. Peter L. Buttenwieser was born in 1936 and Paul Arthur on April 15, 1938. All three boys would go on to successful careers. Lawrence established a thriving legal career; Peter would eventually become best known as a philanthropist (Mother Jones Magazine placed him at No. 2 on its 1998 list of Top Ten "power elite" with "bald ambition"); and Paul became a physician, child psychiatrist and author. The family's country home was in Bedford Village, New York. Benjamin and Helen were still living on 73rd Street when Lawrence married Ann Harriet Lubin on July 14, 1956 in Purchase, New York. But within to years it was owned by the Republic of Guinea as its Permanent Mission to the United States. The Mission remained in the house until 1969 when it was converted to a three-family residence with a doctor's office on the ground floor. It was most likely at this time that the mansard was converted to a glass-walled penthouse. From 1977 to the early 1980's the office was home to Maho Bay Camps, Inc., operators of the "camping resort" on St. John in the Virgin Islands. The resort offered 70 three-room "canvas cottages" each 16 x 16 feet. The rates in 1977 were $150 per week for couples and an additional $15 for each child. The Pulitzer house has suffered some humiliation--the coat of graphite-colored paint over the limestone first floor, window air conditioners in the transoms of the fourth floor windows and, much worse, gouged into the fifth floor stonework. (And, then, there's the matter of the mansard roof.) But overall the elegance of the 1906 remodeling of the Victorian brownstone survives.